This gloomy afternoon was no fun for City fans. Yet again home points went begging against a team below us in the table: 12 points dropped from games against Palace, Swansea, Stoke, Bournemouth and now Newcastle. Hopes of Europa league are fanciful. Take nothing from Newcastle. They deserved the win. They were on the front foot from the start, forcing three corners in quick succession. From one of these Schmeichel had to be very sharp to save smartly a Perez near post header. 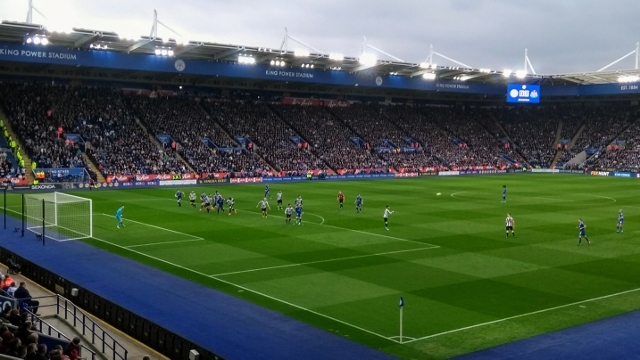 Leicester’s efforts to gain a foothold were thwarted by Newcastle’s well-drilled full-pitch press for much of the first half. City just could not get their game together. Players were often caught in possession or under and over hitting passes. There was a glimmer of a chance in the 14th minute after Mahrez won a corner. The ball fell to Chilwell who played in a good cross in but Morgan could not get purchase on his header. It was no surprise when City fell behind in the 16th minute. Newcastle broke down the left through Gayle. He played the ball inside to the edge of the box where Shelvey had an eternity to collect, manoeuvre and shoot. His effort deflected off Chilwell into the corner of the Leicester net. Three minutes later Gayle featured again, this time hauling Maguire back as the centre half dribbled out of defence. Maguire retaliated seeming to push Gayle in the face and the predictable players’ melee ensued. Referee Atwell showed Maguire a yellow card and also showed one to Newcastle skipper Lascelles for his part in the remonstrations. To the bewilderment of the City fans Gayle received no card despite his initial foul. On the half hour mark some neat passing and a good Chilwell run led to a corner. From the kick there was a coming together between Vardy and Lascelles but the officials were not interested in any penalty claims. City began to get a little more into the game mainly through Silva who was always looking to play a forward ball. Diabate managed a shot but it took a deflection and the resulting corner came to nothing. The 37th minute saw City denied what looked a nailed-on penalty. 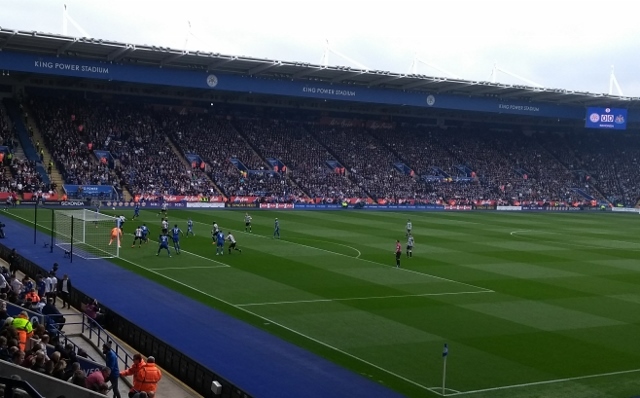 A superb 40 yard Silva pass split the Newcastle defence and sent Mahrez into the penalty area. He was brought down by the retreating Dummett with what was at best a clumsy challenge from behind. Mr Attwell and his linesman took a charitable approach to the tackle to the frustration, annoyance and bafflement of City players and fans. Iborra picked up a knock shortly before the break and had to depart giving Choudury a chance to make an appearance. 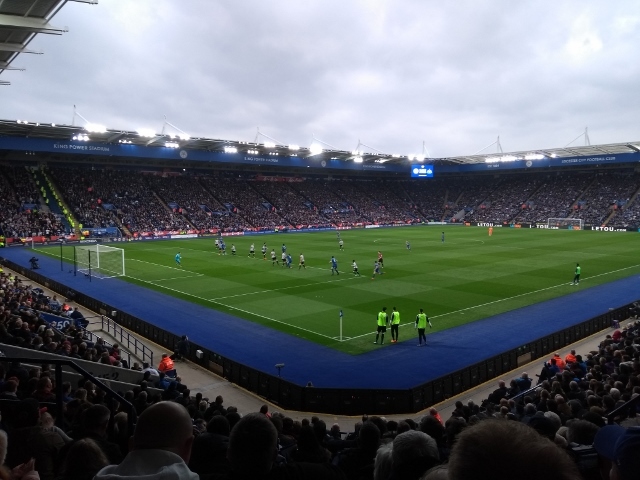 There was time for another City attack with Mahrez sending Vardy down the right but not for the first or last time a City cutback found no blue shirt and the Newcastle defence cleared easily. No changes at half time. City started the second half with much more possession but could not find a way past a tight defensive unit. A good Diabate break led to Mahrez moving into the penalty area but three black and white shirts quickly closed him down and dispossessed him. A Simpson pass fed Vardy down the inside right channel but there was no one on hand to reach his cut back. Meanwhile Newcastle were taking chances to hit on the break and it needed excellent covering work from Choudury to repel one dangerous attack. Choudury was having a very tidy game. On 56 minutes manager Puel replaced Simpson with Okazaki and Albrighton dropped back to right back. Good work by Silva forced another corner which led to a Mahrez goal bound shot that rebounded off Morgan to safety. It was turning out to be one of those days. An hour had gone and Dubravka in the Newcastle goal had not yet been needed to make a save. A manic ten second sequence of four 50/50 tackles eventually led to a City free kick and a corner but again the visitors’ defence held firm. The game was as good as over in the 75th minute. A long Lejeune clearance bounced between Maguire and Morgan. Schmeichel had advanced way out of goal and the alert Perez took the opportunity to score with an excellent lob from 30 yards over the head of the City keeper. City brought on Gray for Diabate and his corner found Morgan who headed wide. But Gray played a key role in City’s goal in the 83rd minute. Cutting in from the left his cross found Okazaki at the far post whose knocked back header was tapped home by Vardy. It was too little too late of course. The closing minutes saw Newcastle comfortable in defence and threatening to score on the break. The additional four minutes seemed miserly given the time Newcastle had taken over set pieces but the visitors still retained their grip on the game. The possession stats were overwhelmingly in City’s favour: the final score was not.